On the ghost tree ride in redwood national park. I'm fresh off the trail with Sis Bruner of Redwood Trails Horse Rides. An Orick native, Bruner grew up out by the little red schoolhouse just south of town. As a young girl, when her dad wouldn't buy her a horse (because you can't milk a horse) she rode a dairy cow instead. "Years ago," she recalls, "every kid in Orick had a horse." Bruner, now 65, rode in Orick's first rodeo in the late 1950s and spent her youth trick riding — think hippodrome stands, wild horse races, vaults and barrel racing — and she's been giving horseback tours along the 44 miles of Redwood National Park trails for over two decades. At the start of my ride, I was given a helmet (optional for riders over 18) and a helper situated me on my horse, adjusted the stirrups and explained briefly how to stop, go and turn. The horses ate some oats, and we were on our way. The afternoon was sunny, and the coastal fog hunched over the ridge by the ocean. We began along the edge of a meadow and trotted past the confluence of Redwood and Prairie creeks. Bruner told me she often sees bears eating blackberries along the riverbank. She pointed out a huge osprey nest at the top of a redwood snag and explained how the local Roosevelt elk give her trouble, even killing two of her horses. After about 10 minutes, we started the steep, rocky and dusty climb up into the forest. We snaked up and around and through ancient redwoods, spruce, ferns and sorrel while sunlight slinked through the tree branches. Bruner chatted the whole way, but it was hard to decipher from a distance, and I wished I could sit in a bar and just listen to her. "I could tell you stories you wouldn't want to hear," she said at one point, smiling and kicking at the ground. The hour-and-a-half ride is Bruner's favorite because it leads up to Goose Pen Tree, where there is a ghost. Honest — Bruner pulled a notebook from her truck and showed me the photos to prove it. There were images of horses with inexplicably translucent legs, and pictures with curious white blobs leaping across them. Bruner says the ghost in the tree is her old dog. "He come out over a lady's head one day." We didn't see the dog, but it was creepy backing into the giant, hollowed out tree for a photo. Bruner says she's had visitors from Japan, Germany and Ireland take rides with her. Her oldest rider was 101, and six is the cut-off point for young riders. To keep the horses happy and moving, there is a 230-pound weight limit. All Redwood Trails rides originate from the Orick Rodeo Grounds. The Redwood Buckarettes run their tour operation from the same field, which was a little confusing. Same-day reservations are usually available, but it's good to call in advance just in case. When you do, try booking a morning trip for the horses' first ride of the day. We went at 2 p.m., after they'd gone out on an earlier tour. By the end of our ride, the horses were right on the edge of cranky. Definitely pee before you start your ride, and plan to have a moderately achey bum for a day or two afterward. Wear layers: jeans, comfy shoes, a sweatshirt. If you plan on taking photos, I suggest you wear a jacket or vest with a zippered pocket. Sticking your phone or camera in your jean pocket doesn't work on a horse, and you can't really access a backpack while heading up the trail because you'll want to be holding on. Tight. 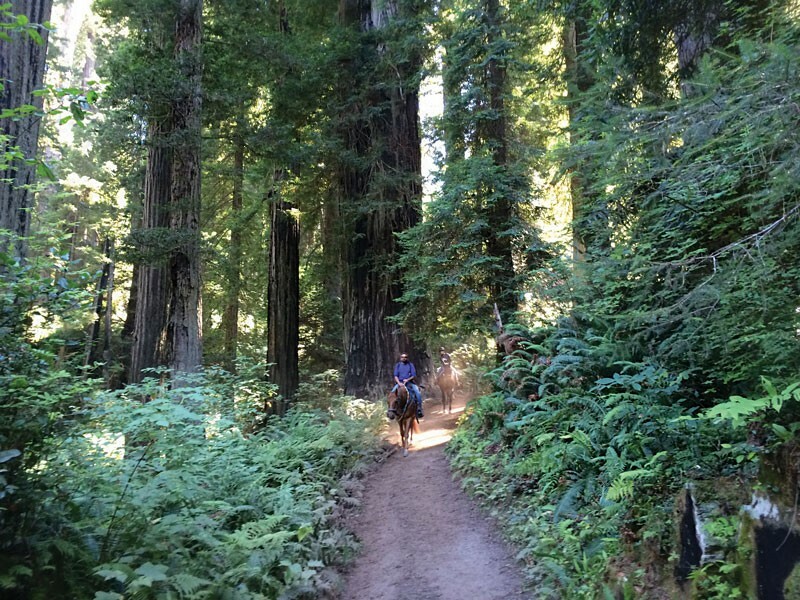 For locals, a horseback ride in Redwood National Park is a great reminder of why we live here. For visitors, it's a unique way to be immersed in the wilds of Humboldt County.